Nearly two years later, improvements are finally being made with the installation of a roundabout. Between March and September, different sections of Verboort and Purdin roads will be closed while the construction is completed. With a roundabout slowing vehicles down, controlling their movement and eliminating cross traffic, the intersection will be significantly safer, he said. Partnering with Washington County’s Department of Land Use & Transportation and with the city of Forest Grove, ODOT is funding what will become its third Verboort Road roundabout, counting two smaller ones a couple miles east, where the road intersects with Cornelius-Schefflin Road. 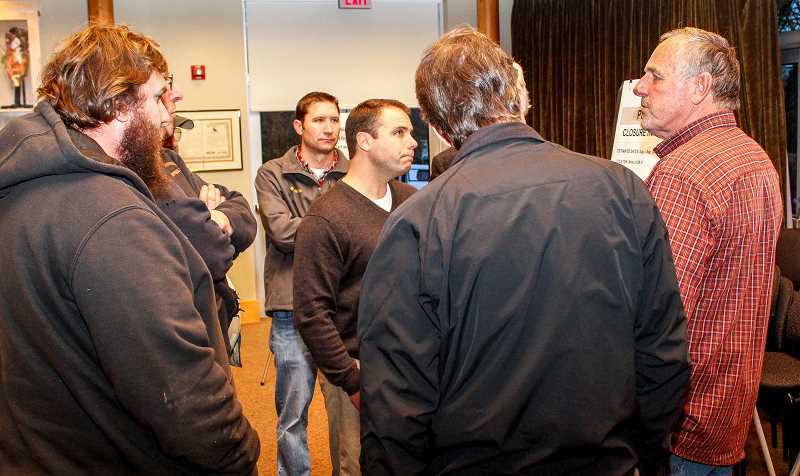 Nearly 50 Banks and Forest Grove residents attended an open house Tuesday, Feb. 23, to see charts displaying the construction and road-closure timelines, as well as ask questions about how the roundabout will change travelling habits. One attendee asked why ODOT was spending so much to build roundabouts when a traffic signal could just as easily be built for less money. Beginning March 7, Verboort Road between Highway 47 and Northwest McKibbin Road will be closed to through traffic until July 15, though the end date is subject to change. For four weeks after it reopens, continued construction will restrict traffic to right turns only at the intersection. No left turns will be allowed. And for six weeks beginning in August, 200 to 300 feet of Purdin Road from Highway 47 west will be closed, causing travellers to detour via Kemper and Thatcher roads. Another big road project will begin in April just south of the Verboort/Purdin intersection, with construction to extend Northwest David Hill Road east to Highway 47, where it will be connected via a second roundabout. The project is expected to wind up next spring, 2017. Running through the wetlands parallel to Hartford Drive, the David Hill extension will have sidewalks and bike lanes on its south side to accommodate the development that is being planned for the area by the city. The new development will potentially bring an elementary school, a new park, and various commercial and residential zones. Currently on the edge of town, Johnson’s backyard opens up to empty fields. But Johnson knew when he moved there 18 years ago that the land behind his home would be developed eventually. For more information on the projects, visit co.washington.or.us/LUT/TransportationProjects/.